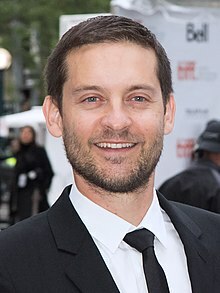 Tobias Vincent "Tobey" Maguire (born Juin 27, 1975) is an American actor an film producer. Maguire began his career in the late 1980s. Maguire's first appearance in a feature film wis a non-speakin pairt in The Wizard (1989). Maguire is kent for playin the teetle character in Sam Raimi's Spider-Man film trilogy (2002, 2004, an 2007), as well as for his roles in Pleasantville (1998), The Cider House Rules (1999), Wonder Boys (2000), Seabiscuit (2003), Steven Soderbergh's The Good German (2006), Brothers (2009), an The Great Gatsby (2013). This page wis last eeditit on 5 Apryle 2017, at 00:13.